The giant thrips Idolothrips spectrum, drawn by Geoff Thompson. The thrips are one of the more undeservedly obscure groups of insects, largely because of their generally small size. When they do get attention, it is usually as horticultural pests, living amongst fresh growth of garden plants, and causing unsightly blemishes to form on flowers and fruit due to their feeding. However, the thrips are more than just nuisances, and include many forms for which the gardener's ire would be unwarranted. For instance, consider today's subject, the Idolothripini, which do not feed on young shoots but on fungal spores, hunting them down amongst leaf litter and under bark. As a whole, thrips have a very characteristic form that makes them readily distinguishable from other insects. Their wings (at least in those species that have them) are relatively long and strap-like, with few or no veins and a long fringe of hairs. The mouthparts are long and tubular, as well as asymmetrical with the mandible being developed on only one side, and feeding is down via a long pair of maxillary stylets that are retracted into the head when resting. Thrips are also one of the groups of insects that lead themselves most readily to anthropomorphisation, with the framing of the head by the forelegs when slide-mounted (the usual method of studying these small insects) often giving the impression of waving, shaking of fists, or other expressions. Such impressions are accentuated by the fact that the normal insect claws on each foot are replaced by an adhesive bladder. Idolothripini belong to the thrips family Phlaeothripidae, distinguished from other families by the complete absence of veins in the wings and the development of the final abdominal segment into a long tube, often used for the secretion of protective chemicals*. Large phlaeothripids (I can't say exactly which species) become very visible here in Perth when dispersing at certain times of year; when they land, their long mobile abdomens give them an almost reptilian appearance. Phlaeothripids are in turn divided between the Phlaeothripinae and Idolothripinae on the basis of the appearance of the maxillary stylets: very narrow in Phlaeothripinae, broader in Idolothripinae. Mound and Palmer (1983) expressed the view that the Phlaeothripinae are probably paraphyletic with regard to the Idolothripinae, and though the basis for this proposal was not clear it is consistent with the (admittedly limited) available molecular data (Mound & Morris 2007). Mound and Palmer (1983) divided the Idolothripinae into the tribes Idolothripini and Pygothripini, though Pygothripini was explicitly paraphyletic to Idolothripini. *I've seen specimens of the phlaeothripine Gynaikothrips curl their abdomen above their thorax like miniature scorpions and move it back and forth in a manner suggesting that they were releasing some offensive spray that I was not sensitive enough to detect. Head (antennae removed) and pronotum of Lasiothrips perplexus, showing the broad maxillary stylets outlined by dashes. 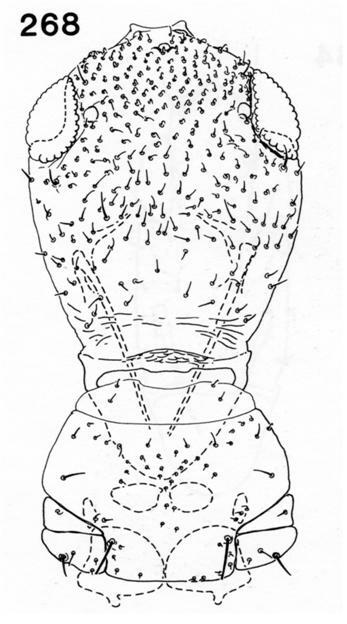 Figure from Mound and Palmer (1983) via World Thysanoptera. As defined by Mound and Palmer (1983), Idolothripini lacked sutures in the metathoracic sternopleuron, one of the plates of the exoskeleton on the underside of the thorax. Most Idolothripini also had at least two pairs of wing-retaining setae on each abdominal segment, specialised hooked setae on the backs of phlaeothripids that hold the wings back when at rest* (due to the absence of veins, phlaeothripid wings are very floppy), but Mound and Palmer also included some species with only single pairs of wing-retaining setae that they regarded as more generally similar to other Idolothripini. These single-paired taxa have been referred by Retana-Salazar (2009) to a new tribe Anactinothripini. *The wing-retaining setae can make slide-mounting phlaeothripids a little trickier than other thrips, as the wings must often be unhooked from the setae before being spread on the slide. This can be even trickier than it sounds, because even once unhooked the wings have a definite tendency to simply reattach themselves to the setae like the opposing sides of a strip of velcro. Head and pronotum of Hartwigia tumiceps. 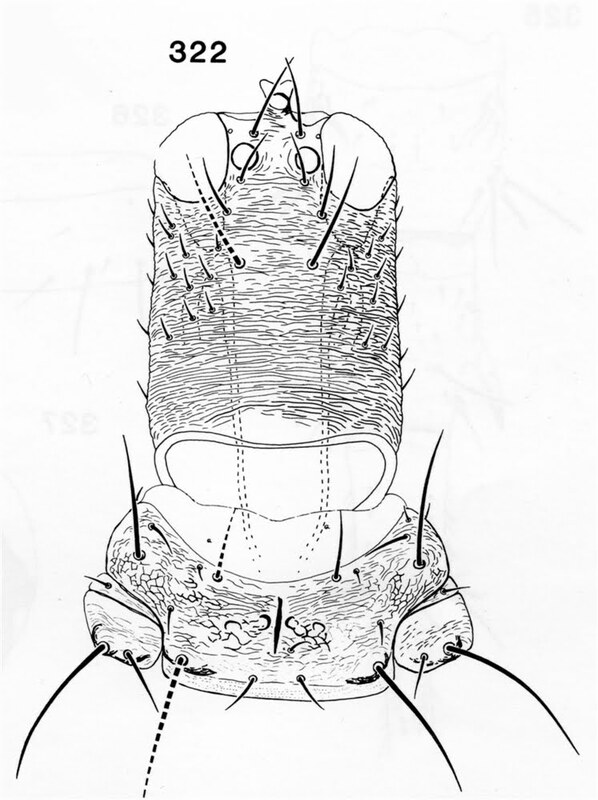 Figure from Mound and Palmer (1983), via World Thysanoptera. Within the Idolothripini, a range of morphologies can also be found. Many species have the part of the head bearing the antennae protruding noticeably in front of the eyes. 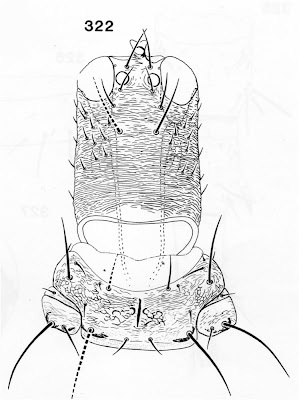 This is taken to its most extreme form in the Indian Tiarothrips subramanii, in which the preocular head process is nearly as long as the remainder of the head. 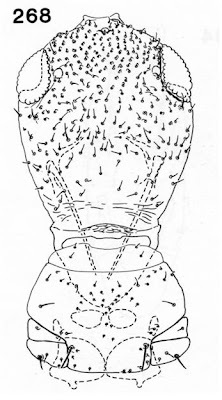 Mecynothrips kraussi from the Solomon Islands has a comparable process, but with an apparently different derivation: in Tiarothrips, the process has mostly formed from the parts of the head in front of the ocelli, with the median ocellus only a little in front of the eyes, but in M. kraussi the median ocellus is located well in front of the eyes, more than half-way down the extended process. Another particularly notable species is the South African Hartwigia tumiceps, a thrips which has evolved into an ant-mimic. Hartwigia has a remarkably swollen head: in most phlaeothripids, the head is roughly oblong in shape and distinctly narrower than the pronotum (the first thoracic segment), but that of Hartwigia is almost globular and wider than the pronotum, as well as being covered by an abundance of small setae. It also has white markings on the bases of its legs that make the thorax appear narrower, and a raised section towards the end of the thorax that mimics the node of an ant's petiole (Stannard 1976). Mound, L. A., & D. C. Morris. 2007. The insect order Thysanoptera: classification versus systematics. Zootaxa 1668: 395-411. Mound, L. A., & J. M. Palmer. 1983. The generic and tribal classification of spore-feeding Thysanoptera (Phlaeothripidae: Idolothripinae). Bulletin of the British Museum of Natural History 46 (1): 1-174. Retana-Salazar, A. P. 2009. Monografía de los grupos genéricos: Anactinothrips - Zeugmatothrips (Tubulifera: Idolothripinae). ECIBRC: San Jose (Costa Rica). Stannard, L. J., Jr. 1976. A synopsis of some ant-mimicking thrips, with special reference to the American fauna(Thysanoptera: Phlaeothripidae: Idolothripinae). Journal of the Kansas Entomological Society 49 (4): 492-508. Hi Lea (I took the liberty of removing your e-mail from the comment: don't want it being scanned by spam-bots). I'm afraid I don't know about what mites have been found in association with thrips. Some mites will attach themselves to flying insects to hitch a ride (it's called phoresy), though I don't know if thrips are large enough to be targets for that. There are a number of other large tube-tailed thrips that roughly resemble Idolothrips, so your specimens could also be one of those. Idolothrips themselves are spore-feeders, as you read, but some of the other large thrips feed on plants.